Badges & Boots Thanks You! 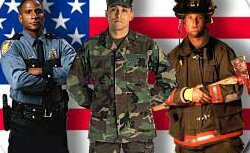 We are so thankful for those of you that serve as a First Responder. Having been a Firefighter, I know how thankless it may seem behind the badge. You hear and see things that most people have no clue of. You see the tragedies of life and yet you keep on going. You also get to see some great things and get to have some great victories in your life. We will be praying for you and your families and if their is anything that we can help you with, just let us know. We want to be a blessing to you and your family. Badges and Boots is behind you all the way!